With all the excitement of receiving gifts this season, I wanted to create a literacy activity for my preschoolers that would take the focus form getting gifts to giving gifts. I did this by doing an “I Can Give…” predictable chart. It is just the Christmas literacy activity to teach the children not only about early reading concepts, but also about the spirit of giving. I have to brag…I am a great gift giver. I’m one of those people who think all year about the perfect Christmas gifts for those whom I adore the most. I make them personal and sentimental. For example, one year before I had kids, I gave my husband a mountain biking themed Christmas. Everything in his stocking and everything under the tree was related to mountain biking, and each and every gift was the perfect combination of useful and enjoyable. From the mountain biking maintenance manual to the Giant brand mechanic’s shirt, the gifts were very well received, and my husband still remembers that Christmas very clearly. Because, that was a time in our lives where my husband and I lived just minutes from some of the best mountain biking trails in the state, and we literally went every single day. But here’s the thing. Physical and tangible gifts are awesome, but so are those gifts that are not material. And that is what I wanted to teach my preschoolers this Christmas season. You see, preschoolers are incredibly generous. My daughter, who is four, really wants to get me LASIK surgery for Christmas, because she hears me complain about having to wear contacts. My son wants to give me a string of pearls, because pearls are basically the only jewelry I wear, and he knows I love them so. But let’s be honest, no preschooler can afford such extravagant gifts, no matter how badly they want to give them. So I wanted to teach my preschoolers the power of giving. I wanted them to understand that the spirit of giving doesn’t have to be tangible gifts that use up all their hard earned savings. To do this, I created a Christmas predictable chart where we wrote down things we could give. And I wanted to stress to my preschoolers that some of the best and most thoughtful gifts didn’t require any money at all, but would still be treasured for years and years. 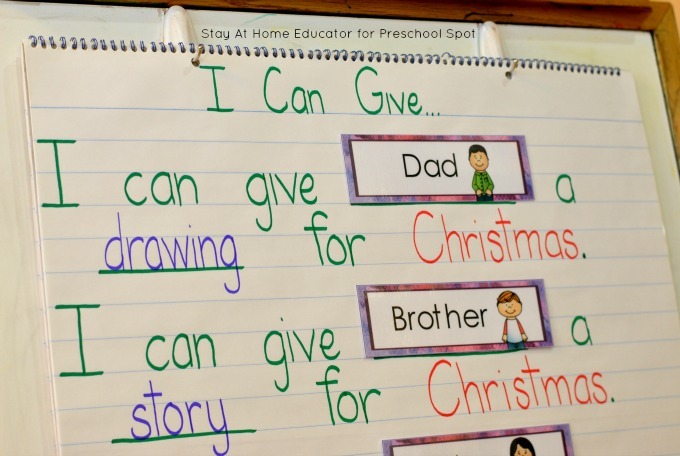 To learn more about this Christmas literacy activity that also teaches the spirit of giving during the holiday season, jump on over to Preschool Spot where I walk you through the entire activity in detail. 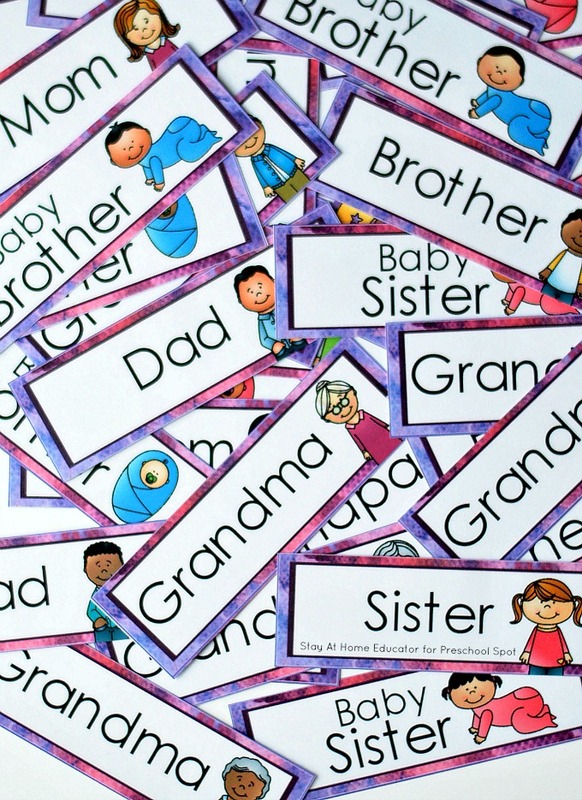 To complete the spirit of giving literacy activity, you may want these the Family Vocabulary Cards. I used them to teach my preschoolers names of family members they may want to give gifts to this Christmas, but they are also helpful in teaching an All About Me theme. I made sure that these vocabulary cards were diverse in the images, because I wanted my preschooler to have the freedom of choosing a picture the resembled their special family member. Download your free cards by clicking the giant red button below! It is sometimes difficult to design Christmas literacy activities that are truly meaningful for preschoolers. I think this one fits the bill. Not only does it teach print awareness concepts, but it also teaches children that it’s equally important (if not more important) to give gifts rather than receiving them. And, they learned that gifts that cost no money can be equally special (if not more) than those what cost a lot. 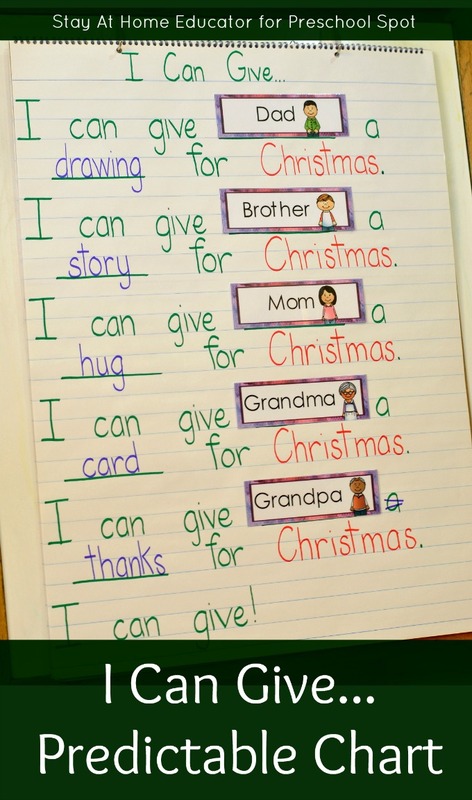 This is a Christmas literacy activity we will be repeating every year because it does such a great job of teaching the spirit of giving. What a great activity to help children develop their spirit of caring for others. Thanks! It was a good lesson for my preschoolers to learn that it’s fun to give, but it doesn’t have to be something bought with money.